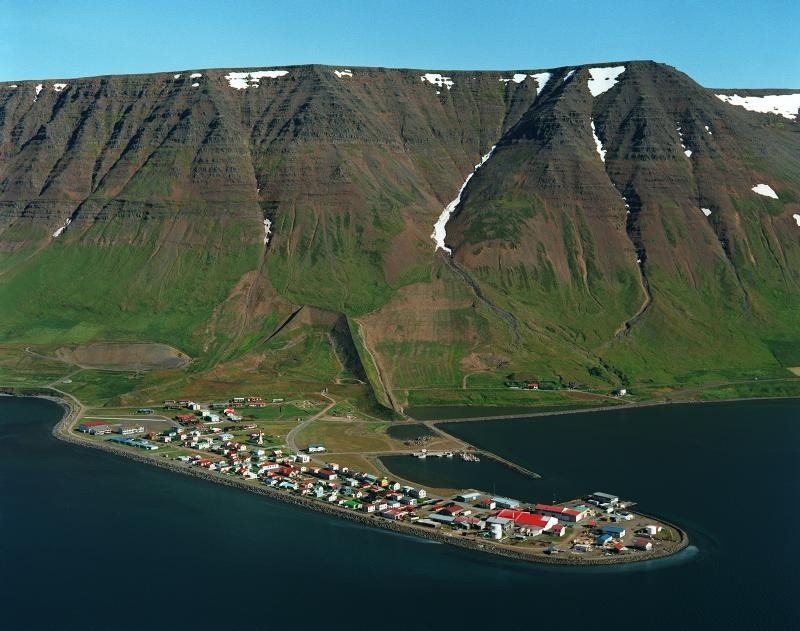 One of the most picturesque parts of Iceland is its northwest, usually called the Westfjords. Here the mountains come close to the coast, and distances between towns are magnified by roads that laboriously travel around the shores of the long fjords that characterize the region. One town I went through in 2013 was Flateyri on the shores of Önundarfjördur, scene of a disastrous avalanche in October 1995. The town had a small population to begin with; and, after twenty people died in the avalanche, many of the survivors pulled up stakes and moved to other parts of Iceland which were not as susceptible to avalanches. To protect against future avalanches, the Icelanders built a retaining wall (visible in the above photo, shaped like an upside-down “v”). The local restaurant, Vagninn, has re-opened; and a cultural center has been built. Small towns in Iceland have had a difficult time surviving, especially when there are no large local projects such as aluminum smelters to act as an employment draw. Meanwhile Reykjavík continues to grow at the expense of rural Iceland. One possibility is that global warming will benefit rural Iceland, with more cash crops being grown outside of greenhouses. This entry was posted in travel and tagged avalanches, flateyri, iceland, westfjords. Bookmark the permalink. Nice! Good description of my homecountry.